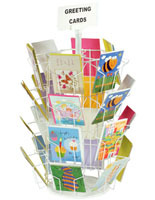 Order These Greeting Card Display Racks by 1 p.m. EST for Same-Day Shipping! Each of These Wire Products Look Great on Countertops. 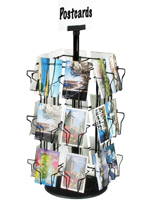 These Storage Basket Units are Must-Have in a Busy Retail Shop. 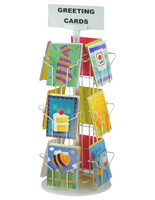 These greeting card display racks can be ordered by 1 p.m. today for same-day turn-around! 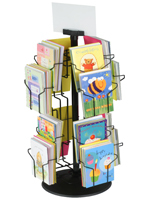 This company has hundreds of wire display racks for sale, all meeting our high standards of quality and functionality! 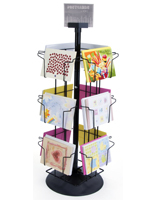 These countertop card racks, storage basket units are housed in a durable round plastic base that keeps the unit upright. 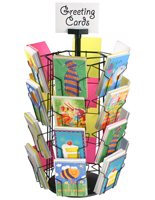 These greeting card display racks that sit on a countertop or shelves showcase your goods and people will enjoy spinning these wire display racks around to find the perfect birthday or Valentine's Day card! 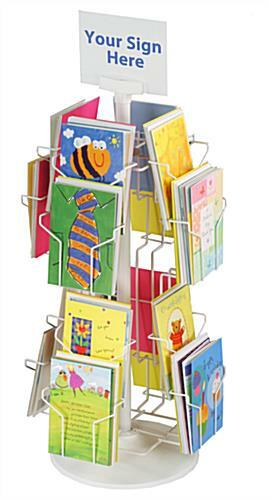 These four-sided racks are separated into (4) pockets on each side, for a total of 16 unique pockets for your merchandise! 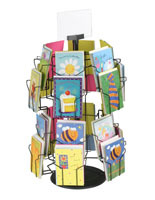 These greeting card display racks help you highlight your most pertinent merchandise. Comprised of steel wire with a white glossy finish, these wire products are shipped disassembled to save you on cost. Your company will already be benefiting from our competitive pricing structure! 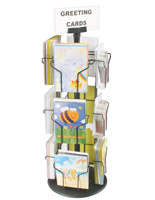 But your staff will have no trouble putting this item together, no tools required. 14.0" x 29.0" x 11.0"